She didn’t like the idea well enough to pay the buck for the glasses. Who had the last bronze baby shoe? While waiting for her, I spied several pairs of bronzed baby shoes on sale. “I wonder when the last baby shoe was bronzed?” I wondered. They were common when I was a kid, but I haven’t seen a fresh set in years; my brothers and I didn’t have our shoes preserved, so far as I know. A Google search led me to the American Bronzing Company’s website. It was founded in 1934 by “Grandma Vi” Shinbach. The company’s website claims it has bronzed more than 14,000,000 baby shoes. The bronzed shoe isn’t a mold: it’s the actual shoe, although some liberties are taken along the way. Here’s a good video that shows the bronzing process. After seeing how labor intensive it is, I don’t think the $59.95 price for the cheapest pair of shoes is all that out of line. 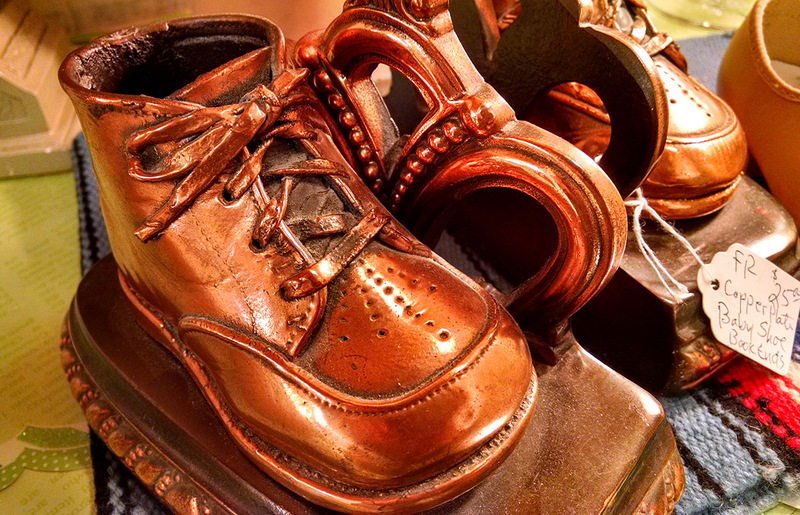 They do more than shoes: They’ll bronze a cheeseburger for $163.95. 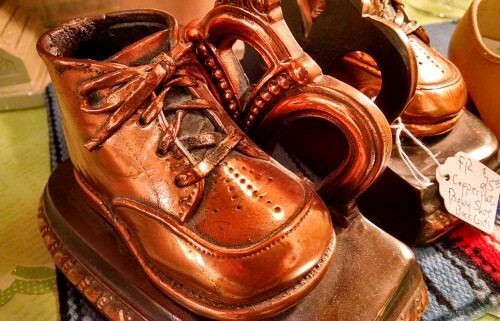 Did your parents bronze YOUR shoes? If so, what did you do with them when you grew up? Did you preserve the shoes of your urchins? My sister and I had bronzed baby shoes. I think they were made into bookends and sat on Daddy’s desk. Our baby teeth were stored in them. I don’t know what happened to them after I left home at 19. I didn’t have much interest in them but now I’d love to have mine. Our boys had their actual first baby shoes with their name and birth date embossed on the bottoms. I sent many pairs of these to friends when they had babies. I think I have them in one of my cedar chests. Still have mine. Born 1946. I had mine made into bookends and use them every day. Based on my memory, our neighbor, Wilmon Huckstep, patented a process similar to bronzing that yielded baby shoes that were preserved in pink or blue. As far as I know, nothing ever became of it. There was a bronze pair of baby shoes with an ashtray set into the base at our home. How shocking that would be for today’s smoke free society. 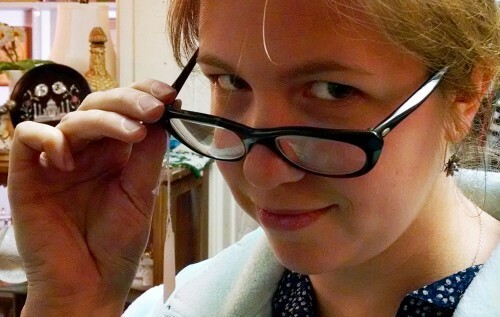 I think they were my sister’s shoes….i was the second child, and you know what tends to happen. I dug up mine. They are engraved on the bottom. From the looks of them they were well used.